This is to officially welcome our precious baby girl Amellia Rose into the world. I am sorry that it has taken me a couple days to get this post up, I know many of you have been waiting for it. Life is kinda hectic with a newborn around. But I love every minute of it, even the middle of the night feedings. So here is her birth story and some pictures. I will try to keep this updated with what is going on, but not sure how much I will be able to get on. Friday December 11, we had to be at the hospital for induction at 6 am. We were immediately shown to our delivery room and got settled in. They checked me when I first arrived and was at almost 5 cm already, but she was posterior or facing up rather than down. By 7:30 am Pitocin was started. They checked me again at 9am and I was close to 6 but not a lot of change. Contractions were about every 3-5 minutes but not very intense. Dr. said they would be back in an hr or two to break my water which should get things moving. A little before 11:30 am, Tommy and I were just getting ready to try to get some rest thinking we would have several hours till anything happened. But that didn't happen. Dr came in and broke my water at 11:30 am. The very next contraction was awful, and before it was even over I said I want an epidural NOW!! The Dr was called. It took about 15 min for him to get there and get set up. Meanwhile each contraction was worse and worse and closer together. I was breathing through them but barely. Finally at 12:05 pm the epidural was turned on. He stayed for a few minutes wanting to make sure it would take effect. It took the edge off but I still could feel them on my left side. So he had me roll on my left side to help it start working over there as well. Just as it was seeming to be working a bit better, the Dr came in and wanted to check me again for any further progress. She immediately said YOUR 10 CM, SHE IS TURNED AND ITS TIME!! Tommy and I just looked at each other as they all started running around getting everything ready. He text my family in the waiting room. And told my mom to hurry up and get in there. The next contraction they had me start pushing. I did a series of 3 pushes for each contraction, 4x and she was out. Born at 12:41 pm. An hour and 11 minutes after they broke my water. 6 lbs 5 oz 19 1/2 inches long. A full head of dark black hair, and perfect in every way. She had to have a little oxygen and be warmed up for a bit but otherwise she was fine. Her apgars were 8 and 9 (out of 10). I didn't get to hold her for about 45 minutes which was hard, but at the same time it just felt like a dream and I was in shock I believe as well. We had our rainbow baby!! When she was first handed to me I cried. It was happy, relieved tears. At that moment I fell completely in love for the 2nd time in my life. I kept asking Tommy to pinch me b/c it had to be a dream. But it was real and she was in our arms. Safe and sound after a long 9 months of stress, worry and doubt at times. By 3:30 pm I was moved to a new room. Amellia was brought in all bathed and looking beautiful. I loved watching her daddy hold and cuddle her. He had the biggest grin on his face. I also loved seeing my parents, Pappy and Nana with her as well. I was in the hospital all day Saturday and then release Sunday late afternoon. As we were leaving the hospital my emotions once again got the best of me. I flashed back to the previous two times leaving the hospital with only a box in my lap. This time I left w/ a car seat with my precious little baby girl in it. They were tears of joy mixed with the emotions of our two losses. I find my emotions and feelings are very much intertwined between this new baby and our two that didn't make it. In fact I see so much of Logan and some of Emma in Amellia. I am so sad they arent here as well, but so thankful that Amellia did make it. So for all you deadbabymama's out there don't give up even when it seems as though there is no hope. Find a Dr that will help you to find answers and who wont give up until you bring your precious rainbow home. I hope and pray that each one of you will get to have this feeling. It was a long, hard, sad road but the end is perfect in every way. I will always miss my Emma and Logan and Amellia cant replace them, but it certainly makes the grief just a bit easier. Its here... finally after a long 258 days of being pregnant, stressing over every little thing, and over 420 self injections. WE ARE DOWN TO LESS THAN 12 HRS TILL I AM INDUCED!!! I had an amino this morning and after an NST to monitor for contractions and an exam, we were told her lungs are ready. The low number they are looking for is 47, her's came back 108!! Dr said that was great!! I am also 4 cm dilated. Only bad thing is she is posterior and needs to flip. So tomorrow when they start the Pitocin and get the contraction rolling hopefully she will flip on her own but if not they will do a c- section. I don't care either way.. just so she is here safe and sound. Its completely surreal... its really going to happen this time. Our little girl will be here tomorrow. I will actually take this baby home. WOW!!! This is such a long time coming. And we are almost there.. EEEEHHH!!! One week and Amellia could be in my arms. Its finally beginning to hit me. It really (might) happen this time. I am afraid to be certain, for obvious reasons. I had an additional NST/OB check today just because. Everything looked great. She is still very active, although the kicks/jabs and rolls are getting more painful. But I still love every minute of it :D So after looking at the schedule for my amino next week, they decided to move the amino back one day. So I will have the amino Thursday morning. It could take up to 3 hrs for the results. If her lungs are ready then they will admit me to the hospital that night and get me started on medicine to soften/ripen the cervix. Then first thing on Friday morning they will start Pitocin and get things rolling. So next week at this time I could have my little princess in my arms.... Just gotta make it less than a week and cross the next hurdle of whether her lungs will be ready. PLEASE LET THEM BE READY!!!! I don't think I can handle being told me have to wait another week. Let this last 6 days be enough and her lungs be developed and ready for the outside world. PRETTY PLEASE!!! I am the wife of Tommy. We have been married 3 yrs. We are currently pregnant with Baby #3. Our first two unfortunatly are not with us. Our firstborn Emma LaRue was born sleeping on 09/01/07, after I lovingly carried her for 31 wks. 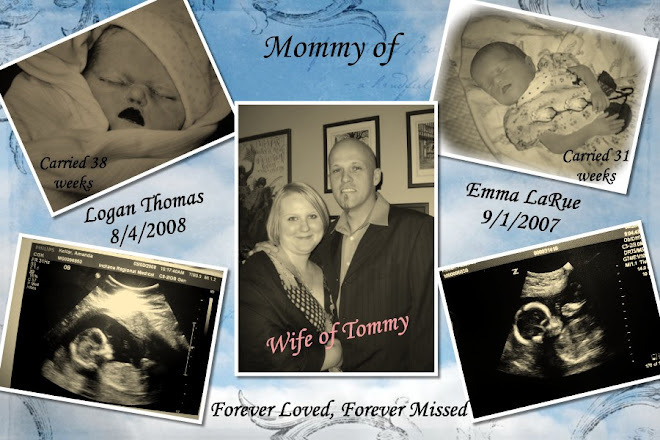 Our second Logan Thomas was also born sleeping on 8/4/08, after carrying him for 38 wonderful weeks. Now I am trying to figure out how to live without my 2 babies. And hopeful for this Rainbow baby and that him/her will be coming home with us in December 2009. I am so thankful for my wonderful husband, who I would be lost without. He is my strength when I feel as though I cant go on. I love you!